For novice Cloud developers, aspiring Cloud architects and all other IT professionals associated with Cloud computing, especially with Microsoft Azure, this article would prove to be useful. Microsoft Azure Account- If not, create your free account clicking here. Go to Microsoft Azure portal, log-in with your Azure account credentials. You will be at Azure portal, be on your dashboard, where you need to add HTML. Select ‘General’ from Tile Gallery drop-down at left pane. Select ‘Markdown’ and drag it to center Window are or wherever you want it to get display. 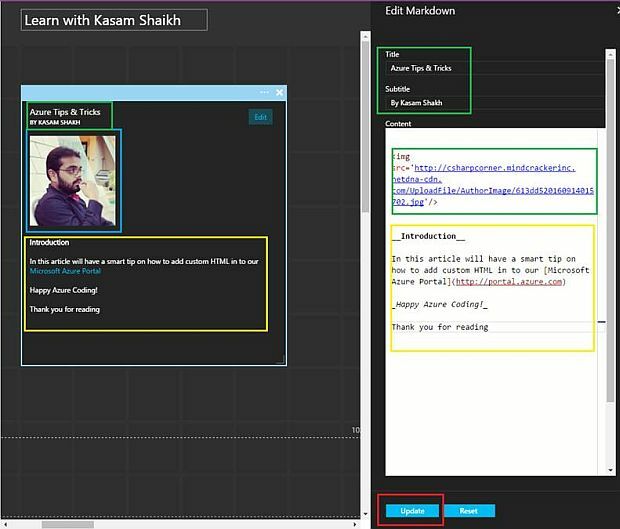 Form with editor would appear in right side of Azure portal, where you can add your HTML tags at Content area. For this article, let’s modify its title, subtitle and content with some commonly used HTML tags like links, bullets, images etc. As highlighted, HTML code is being reflected at added Window on Dashboard pane. You can resize, change the position of the added Window over Azure portal and perform any activities being part of Dashboard customizing. Click ‘Reset’ to get back to its original content, as shown below. Once done with adding all the necessary changes, click ‘Update’ and ‘Done Customizing’ at Top. You are done with adding you own customized Window with HTMLization on your Azure portal Dashboard. By now, we saw, how easy is to add HTML tags window to our Dashboard. You can use this feature for getting ready for any upcoming events, or conference and for many other development activities. Quick Tour of Azure Portal. 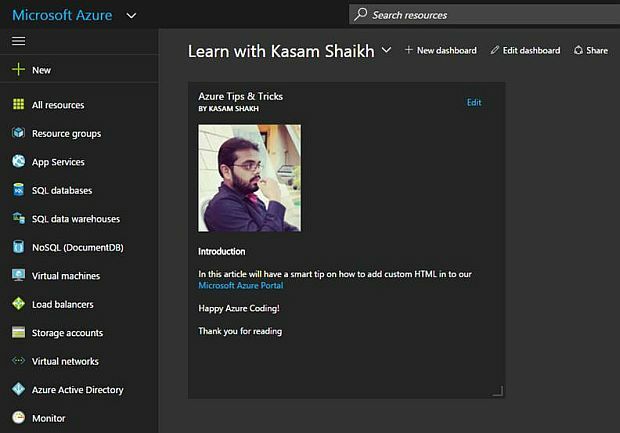 We will be learning more tips & tricks, working with Azure development in the upcoming articles. Stay tuned. Hope, you would have enjoyed this tutorial. If you have any questions with respect to the same or any interesting use-case or suggestion, please do comment below. Knowledge grows by sharing. Don’t forget to share this article. If it would have helped you, it will also help many others too.